Kirill, a 12-year-old boy from Latvia was born with a congenital defect making right arm movements impossible. He is now able to function normally and return home, thanks to surgeons at Rambam Medical Center in Haifa. 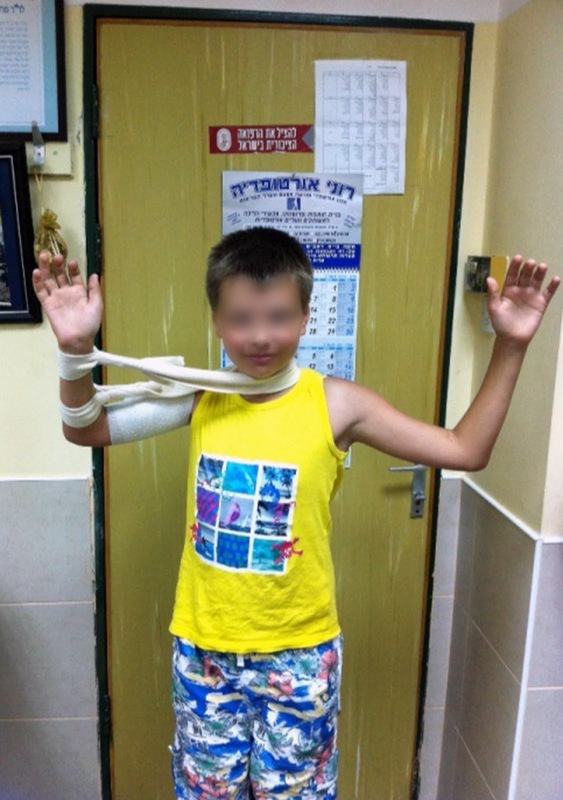 Kirill suffered from brachial plexus palsy, a defect that occurs in one of 3000-5000 births. But in 90 percent of cases, the disability passes by the age of three months. In the case of the Latvian boy - and in approximately eight Israeli children a year - it never did. A week ago, the boy arrived in Haifa to undergo a relatively rare and complicated operation by Dr. Mark Edelman, head of the pediatric orthopedics department at Rambam. The surgeon rotated the boy's wrist 65 degrees and set it in its new location with six screws. Edelman said that it was only the second case he had encountered in his career as a surgeon. "Kirill taught himself to cope with life using only one of his hands. This is a very difficult disability for such a small child," he said. After the three-hour operation and one day of hospitalization, he was discharged last week. Kirill feels well, and for the first time in his life, is able to use both hands. The Palestinian Centre for Human Rights (PCHR) follows with utmost concern the continued closure of the offices of the External Medical Treatment Department in Gaza, and warns of the serious repercussions this closure on the health conditions of hundreds of Palestinian patients in the Gaza Strip who desperately need advanced medical treatment outside the Gaza Strip. PCHR calls for the exclusion of health services from the political conflict, and for prioritizing the interest of hundreds of patients who suffer from serious diseases and wait to be referred to hospitals outside the Gaza Strip to receive advanced medical treatment that is not available in the Gaza Strip. According to PCHR’s research, the current crisis emerged on 15 July 2012, when Dr. Hani Aabdin, Minister of Health in the Ramallah Government, issued a decision appointing Dr. Fathi al-Hajj as the director of the External Medical Treatment Department, replacing Dr. Bassam al-Badri, the former director of the Department, and forming a technical committee chaired by Dr. Sa’id al-Hussieni with 9 different doctors as members. Dr. al-Badri stated to PCHR that when he received the decision issued by the Minister of Health in the Ramallah government on Monday morning, 15 July 2012, he took his belongings from the office and went home. On Tuesday, 17 July 2012, the Ministry of Health in the Ramallah Government issued a statement on its website justifying, what it called, urgent administrative decisions needed to make procedural changes in the External Medical Treatment Department in Gaza. The Ministry stated that these administrative decisions were necessary to meet the needs of patients and ease their suffering. - Each Palestinian has the right to enjoy the most attainable level of physical and mental health is a basic right that the Palestinian Authority must ensure, in accordance with international human rights standards and the Palestinian Basic Law. So, the parties that are responsible for providing health services must take all necessary steps to facilitate the access of Palestinians to health services. A special report by the Israeli watchdog NGO Monitor, http://www.ngo-monitor.org/ revealed the huge flux of money that is being provided by European governments for the Church-based efforts to destroy Israel. This development is paving the way for a new Jewish bloodbath through the vehicle of excluding Israel’s Jews from the family of nations. The UK’s Christian Aid and Finland’s FinnChurchAid received millions from the EU to propagate the worst anti-Israel blood libels, including starving, torture, dispossession and siege. The World Council of Churches, which plays a pivotal role in mobilizing churches in the boycott against Israel, gets annually millions from European taxpayers. European taxes are used in several ways to fund anti-Semitism of an intensity unseen since Nazi Germany. Brussels is putting cash into the pockets also of Islamic terrorists. Europe is financing Israel’s destruction also by channeling millions of euros to secular and leftist NGOs. These are just some: Addameer ($207.000 from Sweden), Al Haq ($426.000 from Holland, $88.000 from bailout-needing Ireland and $156.000 from Norway), Al Mezan ($105.000 from Sweden), Applied Research Institute ($374.000 from the European Union and $98.000 from bankrupt Spain), Coalition of Women for Peace ($247.000 from the European Union) and Troicare ($2.000.000 from Brussels and $640.000 from UK). One of the latest issues of Zayzafuna, the Palestinian Authority magazine for children, included an essay submitted by a girl in which Adolf Hitler is admired because he killed Jews. The story, revealed by Palestinian Media Watch, shows a girl in her dream asking Hitler: “You’re the one who killed the Jews?” Hitler responds: “Yes. I killed them so you would all know that they are a nation which spreads destruction all over the world.” Zayzafuna is financed by Paris-based Unesco and the MDG Achievement Fund, another UN foundation funded by the Spanish government. Today, it was reported that Hannes Swoboda, President of the Socialist and Democratic Group in the EU, ended his visit to Israel and the "occupied" Palestinian territories. His concluding remarks seems to blame Israel from start to finish for the fact that negotiations have not started with the Palestinians and that there are no serious initiatives on the table. Just where do these EU representatives come from. Locked their Ivory Towers, do they not hear and see what is going on. Swoboda held talks with political partners and representatives from the Israeli and Palestinian parties, including the Israeli Labour Party, Meretz and with the Fatah revolutionary council. Swoboda said: "After my talks with representatives from the Israeli government, opposition and military experts, I am concerned to see that the present government is not willing to start serious peace initiatives. "It should be stressed, however, that many Israelis, including civil society groups and the peace movement, are interested in finding a solution. Europe must continue its engagement in the peace process and support all those who are willing to create the conditions to restart the peace process. "Normal relations with Israel and especially with civil society are part of this engagement. But we must avoid any 'upgrading' of relations with Israel which could be misunderstood as support for or acceptance of the Israeli government's policies. We must be clear that the continuing illegal settlements and eradication of Palestinian villages undermine any attempts to find a just solution in the Middle East and go against the EU's policies for peace and security. Government legislation and activities relating to the Arab population and the Bedouins are also not in line with democratic principles. "Prime Minister Binyamin Netanyahu is failing on both the peace process and the domestic social challenges, and the European Social Democrats are happy to see the new leadership of the Labour Party taking up these issues and aiming to reverse these alarming trends. The emphasis on social justice and fairness is fully in line with social-democratic policies inEurope." "In my talks with the leadership and the chief negotiator of the Palestinian Authority, I found a strong willingness to find a compromise with Israel [does this guy not look at what Abbas says to his Palestinian street. As with Arafat, Abbas says one thing in English to which ever useful idiot he is tsalking to and completely the opposite when talking in Arabic]. But the economic and financial situation is getting worse and this is making it harder for the Authority to perform basic tasks for its citizens. "Europe should not only continue to offer financial support but also support the organisation of local elections in the autumn in order to give local leaderships a democratic basis. We should also support Fatah's position that national elections must take place in the whole of Palestine before any reconciliation can be reached with Hamas. "The negotiations for an action plan with the Palestinian Authority are going well and such an agreement could further stabilise the Palestinian leadership. The situation of the tiny Christian community of the Gaza Strip, which reportedly (AP) comprises 1,500 members residing amongst 1.5 million Muslims, is precarious at best. Living in a territory ruled by Hamas, a Muslim fundamentalist terrorist organization, Christians are being subjected to mistreatment, while reports of forced conversions to Islam continue to surface. Ever since Hamas seized Gaza from the secular Fatah movement, Christian residents of the Strip have feared for their lives, appealing to the international community to protect them from attacks by Islamist extremists. One year after the Hamas 2006 takeover, Rami Khader Ayyad, the owner of Gaza’s only Christian bookstore, was kidnapped, brutally beaten and murdered. Christian schools, shops and a church have been firebombed and looted, while individual Christians have been harassed and robbed. These acts and others have apparently led Christians to flee Gaza. AP reported (July 17) that since Hamas took over in 2006, the number of Christians in Gaza has decreased from 3,500 to 1,500. Those left feel threatened but prefer to keep silent about the way they are treated. • Palestinian media reported that scores of Christians held a sit-down strike (16 July) at the Elrom Orthodox Church in Gaza City to protest the kidnapping of a young man and two young women, and the attempt to forcibly convert them to Islam. • Bishop Alkesius, head of the Orthodox community in the Gaza Strip, claimed that Ramez Alamash, a 24-year-old Christian resident of Gaza, was kidnapped by Muslims on Saturday, 14 July. According to the bishop, the kidnappers are demanding that he convert to Islam. They are holding him in a refugee camp, either Almaghazi or Alborj. He added that the young man’s mother went to the police to submit a complaint, but nothing was done because the leader of that group of Muslims is Dr. Salem Salame, who represents Hamas in the Palestinian Legislative Council and is also the Chair of the Association of Religious Sages of Palestine in the Gaza Strip. The Bishop noted that the mother didn’t feel well and was taken to Shifa Hospital in Gaza, where she had contact with the kidnappers, who brought her son to the hospital under heavy guard. However, they refused to let him return home. The Bishop appealed to all the official entities in Gaza to put an end to the kidnapping of Christians by armed Islamic groups, who (according to the bishop) drug the Christians and demand that they convert. • The Public Relations office of the Orthodox Church reported that on July 11 a woman and three girls were kidnapped from their home. The Church appealed to Hamas Prime Minister Ismail Heniya. In its press release, the Church noted that the police refused to intervene in the Ramez kidnapping (above) because an Islamic religious figure (Salame) was involved. The Church concluded that no one is safe and that the law cannot protect Christians, and holds the Hamas government and senior officials responsible. On July 18th, a pair of motherless twins, a boy and a girl, were released from Rambam's Neonatal Intensive Care Department. Even the department's senior nurses - who have seen it all - wept, as the twins' story is truly unique. For close to ten years, the twins' mother had tried to get pregnant. The woman, who had married young, began fertility treatment. To her and her husband's delight, she became pregnant. At the beginning of her seventh month of pregnancy, the catastrophe began. The young woman started suffering from unexplained breathing difficulties, and arrived at the Department of Emergency and Urgent Care Medicine at Rambam. Her examination revealed a painful picture - a tumor in her lungs. The young woman was sent for further testing, which showed, to her doctors' sorrow, growths that had spread throughout her lungs and metastasized to her liver. From this point, the situation rapidly deteriorated. In her 31st week of pregnancy, the woman was rushed in for an emergency Caesarean section, which would allow her to begin chemotherapy in a desperate effort to halt her illness. The woman did not successfully make it through surgery, however, and was rendered unconsciousness and in need of respiration. At the Intensive Care Unit, doctors made every effort to return her to consciousness. "The mother had to be respirated because her lungs had collapsed," explained Mirit Barzilai, a nurse from the unit. "Nevertheless, we succeeded in returning her to consciousness for a short period. We told her the twins had been born healthy and everything was all right. Because of the respirator, she couldn't talk, but she started to cry. Soon after, we had to anaesthetize her again." Meanwhile, the twins, who had been delivered by C-section six weeks earlier, were transferred to the Neonatal Intensive Care Department. The mother, still unconscious and respirated, began to receive chemotherapy at the Intensive Care Unit. The new father ran between departments from his infants to his wife. Ten days after the operation, the young mother died. In an unorthodox move, Professor Shraga Blazer, director of the Neonatal Intensive Care Department at Rambam, asked the twins' grandparents to enter the department and help out with the infants: "I understood that the grandparents would have to learn once again how to take care of little babies, but there was no choice, as the father had to return to work," says Prof. Blazer. Currently, Rambam's premature unit is especially busy, with triplets, several pairs of twins and other infants, resulting in a 20% increase in the number of premature babies being treated. In spite of their numerous new patients and full schedules, senior nurses at the unit say they will remember the twins for years to come. A terrorist attack on a bus carrying Israeli tourists in Burgas, Bulgaria Wednesday killed seven people on board and injured at least 20 more, several critically, according to the Bulgarian Foreign Ministry and Israeli Police. The tourists had landed at Burgas’ Sarafovo Airport on a flight from Tel Aviv and had just boarded buses to travel to the city’s Globus Hotel. Bulgarian media said 44 people were on the vehicle at the time of the explosion, about 5:30 p.m. local time. All of the buses were still in the airport terminal. Prime Minister Benjamin Netanyahu held security consultations following the terror attack in Bulgaria today (Wednesday 18 July 2012). The Prime Minister sends his condolences to the families of the victims and wishes a speedy recovery to the wounded. A senior Rambam orthopedist, Dr Mark Eidelman, recently participated in an international medical delegation to the city of Loja in southern Ecuador. There, delegation doctors treated local patients with various orthopedic problems, some of them severe. Dr Eidelman and another Israeli doctor held a surgical marathon: within four days they performed operations on 33 patients, most of them children from neighboring villages. By way of comparison, surgeons at Rambam, northern Israel’s largest hospital, carry out five to ten pediatric orthopedic surgeries weekly. The delegation acted under the auspices of a voluntary US organization, ‘Operation Rainbow’. The California-based organization sends surgeons to different Latin American countries, to areas lacking medical knowledge, equipment and personnel. Among those on the 22-member delegation were five doctors, nurses, and physical therapists, accompanied by two and a half tons of medical equipment. According to Dr Mark Eidelman, director of Rambam’s Pediatric Orthopedic Department, the doctors faced a difficult challenge. “The university hospital in Loja, where we performed the operations, publicized our mission about a year ago. Since that time, some 350 candidates requested operations, and doctors at the hospital chose 75 cases that seemed most urgent,” explained Dr Eidelman. Despite the fact that this effort involved orthopedic patients with limited mobility, people covered great distances to receive treatment. “Most of the patients came from villages in a range of 500 kilometers from the hospital, but these people had little choice. What can an eight-year old girl who has waited five years for treatment do if there is no pediatric orthopedist in her region?” said Dr Eidelman. The latest UNESCO decisions will only whet the Palestinians’ appetite to encroach on more religious sites within Israel. In Washington they joke that no one is safe so long as Congress is in session, but nothing can compare to the “Flat Earth” society operating within the UN system. Last week, the United Nations Educational, Scientific and Cultural Organization made a series of decisions regarding religious sites in the Holy Land that are both patently absurd and woefully unhelpful in the search for peace and mutual understanding in this fractured region. First, UNESCO followed up on last year’s admission of “Palestine” as a member state of the world body by listing the Church of the Nativity in Bethlehem as a World Heritage site located in this nonexistent country of Palestine. Incredibly, the traditional place of Christ’s birth and the pilgrimage route leading to it were also added to the list of endangered World Heritage sites. In pushing for this decree, the Palestinian Authority argued that the Church of the Nativity was in danger because the “Israeli occupation” was preventing them from repairing a leaky roof in the church as well as blocking access to this revered site. Ahead of the vote, a team of UNESCO experts had visited Bethlehem and determined that the church, in fact, was not endangered and did not even qualify yet for World Heritage status. The Catholic, Greek Orthodox and Armenian Orthodox clerics who oversee the Nativity compound concurred with these findings in a letter sent to UNESCO in April, which urged that the site not be turned into a political football. Yet a majority of the UNESCO World Heritage Committee did just that at its annual session in St. Petersburg last Friday. Ignoring the pleas of the clergymen and the advice of their own experts, 13 of the 21 member states on the Committee voted to prematurely grant the church World Heritage status and blame Israel for endangering it. Now Israel was not opposed to listing the Nativity Church as a place of great significance to the entire world. But it did object to the politicizing of the process and to the finding that it is endangered. After all, nothing is stopping the roof repairs and over two million Christian pilgrims managed to safely visit the Church of the Nativity last year. In another swipe at Israel last week, the UNESCO Committee also endorsed a Jordanian declaration from some 30 years ago that accused Israel of endangering the Temple Mount and walls of the Old City of Jerusalem. Amman managed to add Jerusalem’s walled city and the Temple Mount to the World Heritage list in 1981 and then to the endangered list in 1982. But according to the Petra news agency, UNESCO has now accepted the Hashemite Kingdom’s claim that it has jurisdiction over these areas and that the Israeli occupation is harming the cultural heritage of the city. The issue of Jerusalem is back on UNESCO’s agenda because Israel is trying to repair a rickety foot bridge to the Mughrabi Gate, the only access to the Temple Mount compound for Jews and Christians. It has been in danger of collapsing in recent years due to local earth tremors and heavy winter rains, and Israeli authorities have developed plans to replace the wooden bridge with a sturdier structure. But Jordan has objected, insisting it alone has the right to make the repairs. The Palestinians also exert a claim to being the proper guardian of the Muslim and Christian holy sites in Jerusalem, yet the PA backed the recent Jordanian effort at UNESCO. This is because the Israeli plan calls for first conducting an archeological excavation of the embankment underneath the Mughrabi bridge and the Palestinians are afraid even more artifacts will be uncovered there proving the ancient Jewish connection to the area. So it is clear that the Palestinians are once again manipulating UN forums like UNESCO, where they enjoy automatic majorities against Israel, to further their political campaign to delegitimize the Jewish state. In this instance, they have portrayed Israel as a reckless and uncivilized destroyer of cherished Christian and Muslim holy places, and thus unfit to be included in the family of nations. In addition, the PA is once again circumventing direct talks with Israel to achieve peace or cooperation at any level and instead trying to impose solutions from the outside. UNESCO should not be lending itself to such machinations, as this undermines its own stated goal of contributing to the building of peace among nations and peoples through an intercultural dialogue based upon respect for commonly shared values. Yet UNESCO members have now entrusted a revered church to a Palestinian regime that has compiled a sordid record on safeguarding Christian and Jewish religious sites. For example, PA police stood by in October 2000 while a Palestinian mob looted and razed Joseph’s Tomb in Nablus. Upon orders from PA leader Yasser Arafat, PA security forces also assaulted and forcefully removed Russian Orthodox priests and nuns at monasteries in Hebron and Jericho. Perhaps the most egregious example of the PA’s lack of credibility when it comes to safeguarding holy sites occurred at the very Church of the Nativity now entrusted to the Palestinians. In a dramatic April 2002 standoff with IDF troops, gunmen from Arafat’s own Fatah faction truly endangered the historic Church by commandeering the building and wiring it throughout with explosives. In contrast, it cannot be stressed enough that Israel has a far better record on safeguarding and allowing access to holy sites than any other sovereign who has ruled the Holy Land over these many centuries. Yet the fiasco goes on! And the latest UNESCO decisions will only whet the Palestinians’ appetite to encroach on more religious sites within Israel. In 2010, it was Rachel’s Tomb near Bethlehem. Next, we could see the PA exerting its claim to the Western Wall, which they insist is a Muslim holy site known as the al-Buraq Wall, where Muhammad tied his winged horse in his mythical “Night Journey.” After all, it lies just inches away from the “Israeli occupied” Mughrabi bridge. The writer is media director for the International Christian Embassy Jerusalem, www.icej.org . Syria Running for the U.N. Human Rights Council!! Is this the real world we are living in? One has to ask, how does the sane part of the world allow the utterly hypercritical UN HRC to continue to operate this way. So much for Kofi Annan's attempts to reconstitute a human rights committee that has cresibility. GENEVA - In the past decade, the U.N. Human Rights Council elected Col. Muammar Gaddafi’s Libya as chair, hailed Sri Lanka’s “promotion and protection of all human rights” after its army had killed thousands of civilians, and convened an emergency session to lament the death of Sheikh Ahmed Yassin, founder of the Hamas terrorist organization. Even so, historians will now have to decide whether the U.N.’s flagship human rights body is about to sink to a new low. According to a U.S.-sponsored and EU-backed draft resolution that was debated today during informal meetings at the council in Geneva, the murderous regime of Bashar al-Assad is a declared candidate for a seat on the 47-nation U.N. body, in elections to be held next year at the 193-member General Assembly. As part of the U.N.’s 53-nation Asian group, Syria’s candidacy would be virtually assured of victory due to the prevalent system of fixed slates, whereby regional groups orchestrate uncontested elections, naming only as many candidates as allotted seats. That’s how non-democracies like China, Cuba, Russia and Saudi Arabia won their current seats, and how Pakistan and Venezuela are about to do the same. Fears that Syria will indeed win—in a 2013 election for a position starting the following year—appear to have mobilized the U.S. and the European Union into taking the unprecedented action of asking the council to declare in advance that a candidate country, in this case Syria, be declared inherently disqualified to join its ranks. In a strongly-worded resolution condemning the Syrian government for committing atrocities, slated for a Friday vote, paragraph 14 “stresses that the current Syrian government’s announced candidacy for the Human Rights Council in 2014 fails to meet the standards for Council membership” as set forth in its founding charter. That Syria is a contender came as a major revelation. Shockingly, the perfectly reasonable attempt to keep Syria away from the world’s highest human rights body was met with strong resistance. In today’s discussions, Cuba declared itself “totally opposed,” and demanded the paragraph’s deletion, a position quickly echoed by China. It was for the General Assembly to decide whom to elect, insisted Havana. However, as noted by the Americans, the public record shows otherwise. Syria actually had declared its official candidacy in early 2011, around the time the killings began. It was only after UN Watch revealed Assad’s bid and organized an international coalition of human rights groups to fight it that Western democracies rallied to the cause, applying heavy pressure on the Asian states. At the last minute, on May 11th last year, a deal was announced: Kuwait would replace Syria. Assad’s U.N. Ambassador Bashar Ja’afari made clear, however, that his country had agreed only “to reschedule the timing of our candidacy,” saying they would run instead in the 2013 elections, for a three-year term. His Kuwaiti counterpart corroborated the pact. “We agreed to exchange terms,” said Ambassador Mansour Ayyad Alotaibi. “Syria is not withdrawing,” he told reporters. But once Kuwait’s entry ended the controversy, no one—until now—had paid any attention to the fact that Syria would actually run again soon. Though it’s truly difficult to imagine how the Asians could, in face of all the horrors taking place, allow Syria to be one its candidates, the reality is that they did so just last year, changing their minds only after massive lobbying. What is more, this past November Syria won unanimous election to two human rights committees of UNESCO, the U.N.’s Educational, Scientific and Cultural Organization. Despite the suspension of Assad’s regime from the Arab League, the very same nations’ UNESCO ambassadors in Paris refused to allow objections to a country’s human rights record to interfere with their backroom rotation deals—lest one day the precedent be used against them. They nominated Syria, and it was duly elected. After UN Watch campaigned against this obscenity, too, the U.S. and Britain attempted remedial action. Yet despite their best efforts, the old boys’ club could not be convinced to expel one of their own. Syria remains a full member of UNESCO’s committee to judge human rights complaints, and of its committee dealing with human rights organizations. And unless America’s laudable effort succeeds, Syria may soon win a seat on the world’s highest human rights body as well. Today the Palestinian Central Bureau of Statistics (or PCBS) commemorated World Refugee Day by releasing new statistics on Palestinian refugees. Therein lies a tale. The Palestinian Refugees are characterized as young population where 41.7% of them are under the age of 15 years for Palestinian refugees in Palestinian territory, 35.9% of Palestinian refugees in Jordan in 2007, and 33.1% for Palestinian refugees in Syria in 2009, while 30.4% for Palestinian refugees in Lebanon in 2010. This is bizarre, and the new statistics are a reminder of the unique definition applied to Palestinian “refugees.” For every other category of refugees in the world, the 1951 UN Convention on the status of refugees clearly applies to the refugee only and not subsequent generations. This is the definition used by the UN High Commissioner for Refugees today. Only in the Palestinian case does a separate organization, the UN Relief and Works Agency, count not only those who actually left their homes but those in succeeding generations, presumably forever, and regardless of whether those progeny were born and are settled elsewhere with full citizenship. It is not surprising that the Appropriations Committee of the U.S. Senate on May 31 adopted an amendment defining Palestinian “refugees” the way all other refugees are defined, and rejecting the definition that produces the number 5.1 million today and who knows how many more millions as the years roll by. What’s surprising is that this effort, led by Sen. Mark Kirk of Illinois–who would represent the young boy in my illustration, and his parents–was widely held to be controversial. It is common sense.